For all of you with teenagers or who have had teenagers, or are a teenager, you may want to know why they really have a lot in common with cats: - Neither teenagers nor cats turn their heads when you call them by name. - No matter what you do for them, it is not enough. Indeed, all humane efforts are barely adequate to compensate for the privilege of waiting on them hand and foot. - You rarely see a cat walking outside of the house with an adult human being, and it can be safely said that no teenager in his or her right mind wants to be seen in public with his or her parents. - Even if you tell jokes as well as Jay Leno, neither your cat nor your teen will ever crack a smile. - No cat or teenager shares you taste in music. 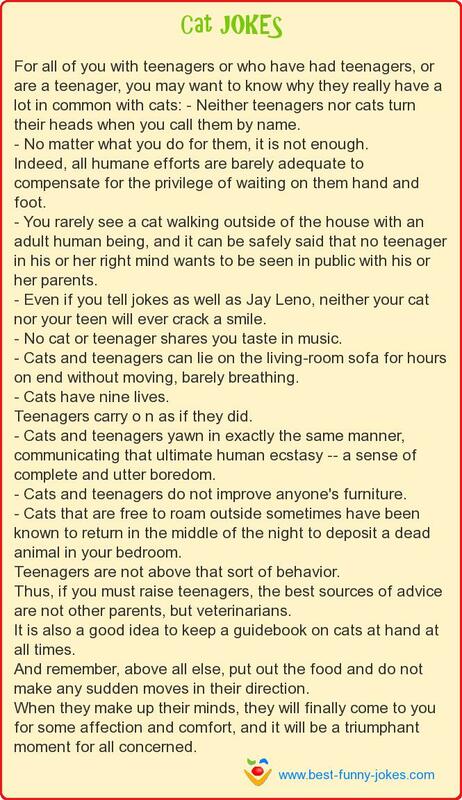 - Cats and teenagers can lie on the living-room sofa for hours on end without moving, barely breathing. - Cats have nine lives. Teenagers carry o n as if they did. - Cats and teenagers yawn in exactly the same manner, communicating that ultimate human ecstasy -- a sense of complete and utter boredom. - Cats and teenagers do not improve anyone's furniture. - Cats that are free to roam outside sometimes have been known to return in the middle of the night to deposit a dead animal in your bedroom. Teenagers are not above that sort of behavior. Thus, if you must raise teenagers, the best sources of advice are not other parents, but veterinarians. It is also a good idea to keep a guidebook on cats at hand at all times. And remember, above all else, put out the food and do not make any sudden moves in their direction. When they make up their minds, they will finally come to you for some affection and comfort, and it will be a triumphant moment for all concerned.